This spring, four Baruch College students are trading classroom instruction for real-world lessons as selected participants for the 2019 New York State Senate Undergraduate Session Assistants Program. Only about 30 undergraduates are accepted into coveted program, which runs from January until April in Albany, the state capital. Three of the students are in the Bachelor of Science in Public Affairs (BSPA) program at the Austin W. Marxe School of Public and International Affairs; one student is majoring in political science from the Weissman School of Arts and Sciences. During the semester, the undergraduates are gaining an understanding of the legislative process—from concept to policy—and learning how to resolve constituent problems and navigate procedures of legislative sessions. Such internships are valuable, meaningful experiences for students who aspire to careers in the public sector, explained David Jones, PhD, chair of the department of political science at Weissman. 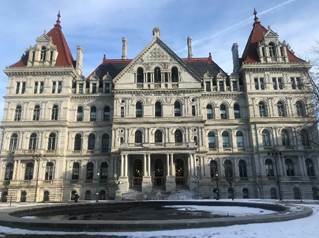 The Senate awards a $6,200 stipend, and The City University of New York (CUNY) provides an additional $2,000, to each intern to cover living expenses. Nicholas Paretta is the director of the New York State Senate Undergraduate Session Assistants Program. This year’s participants express various interests ranging from sustainable communities, to women’s and children’s rights, to affordable housing and transportation. Each one will work with the office of an assigned New York State senator, and learn about their district and needs of constituents. I came to Baruch as an Accounting major at the Zicklin School of Business but switched to Public Affairs because my interests in education, law, and statistics felt better suited to that major. I am interested in an internship in government to work on my public speaking and persuasion skills while getting to know what constituents care about. I want to advocate for the rights of children as it relates to educating them in a digital world and giving them access to information. I also want to work with a team focused on creating sustainable communities, because the cost of production (the amount of water, gas, and energy) is too high to sustain globally. My primary interests in public affairs are politics, housing and transportation. I believe New York City (and the region) have a dire need for new, denser housing to help fight our current affordability crisis. We also need improved mass transit infrastructure to maintain the high levels of mobility in our city and help the region handle a growing population. As a Senate intern, I hope to witness the legislative process firsthand, how legislators perform their duties, how the state government responds to the crisis at the MTA, and to take greater responsibility to better myself, gain experience and become a more capable public servant. I chose public affairs as my major because being an activist is essential to my identity. I am interested in environmental justice, community development, human rights, intersectional racism and women’s rights. I look forward to having access to a platform in which I will be able to attend lectures of distinguished professors and network with a diverse cohort of passionate young leaders who are dedicated to creating and implementing innovative solutions to the world’s most pressing issues. I want to gain firsthand experience and learn more about the legislative process on a state level. In the future, I plan to run for an elected official position. Having advocated for and greatly contributed to the student body of the City University as a student leader, I was fascinated by the opportunity to expand the scope of my public service to my larger community, New York State. I have been inspired by local officials and their activism for as long as I can remember, as the impact of their legislating can be so profound in our communities. Whether in the form of creating a neighborhood green space, working with other local representatives to respond to community concerns or even fighting for equal protections of their constituents, their representation can last a lifetime. That is why I am incredibly proud to have been selected to participate in the New York Senate program and I look forward to applying the skills that I learn to the lifetime of public service that I plan to lead. Go to the virtual tour website to learn more about the Marxe School and Weissman School.